We are entering week four of the new roof saga and our garage and surrounding area are being transformed into a builders yard more and more each day. The lads are doing their best to keep things in order but it's a big job to replace such a large roof and so I can't complain too much. This is what it's looking like around here. Today Smiling Sally is once again hosting her ever popular Blue Monday event, so please go on over I know you'll see far prettier blues than these there. Maybe next week I'll have something prettier to show you too, j'espere! Labels: Blue Monday, House, Normandy, Roof. There are so many blog parties happening this week that I just have to combine 3 in 1. 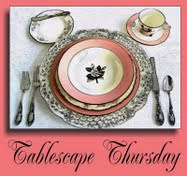 On Thursday Susan @ Between Naps on the Porch is graciously hosting Tablescape Thursday. Follow this link to see her own stunning tablescape and the other beautiful tablescapes she always receives from all those talented ladies out in blogland. and Barb's Rooster Party here@. Bella Vista. Follow the links to join in all the fun. At the weekends we like to linger a little longer over breakfast. It’s never a big meal, not really a brunch. But we do enjoy the simple luxury of fresh farm eggs collected that morning from a neighbors’ hens, lightly boiled, and soft buttery croissants, still warm from the boulangerie. We like to gently prise them apart, they are very flaky, and smother them with either Bonne Maman blackberry or apricot confitures or homemade blackcurrant jam. Freshly pressed coffee, hot and strong. Now what could make things even more special? A fresh & citrusy Mimosa Cocktail served in a Baccarat crystal wine glass peut-être? This has to be the easiest cocktail to make. Simply pop a bottle of your favourite champagne (we happen to love Pol Roger) and a carton of good orange juice (sans pulpe) into the fridge to chill overnight. Next morning, whilst the coffee is brewing, fill a cocktail shaker with crushed ice and add 2 good dashes of champagne & 2 of orange juice, per person. Give it a quick flick of the wrist, pour into champagne flutes (or Baccarat wine glasses) et voilà your perfect Mimosa is ready to enjoy. Fabric place mats & napkins, and coffee mugs: Williams Sonoma. Rooster table mats & matching coasters: Seagull Studios. 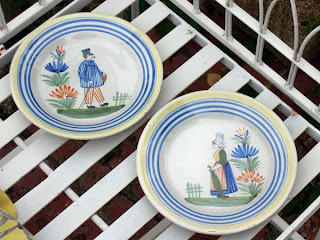 A modern Quimper-Blue Rooster serving dish kept the croissants warm. 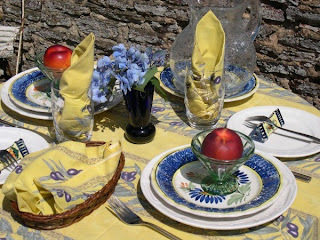 The quirky coq napkin rings are holiday souvenirs and remind us of trip to Denia, Spain in 2007. The large & funky ceramic hen was a gift from Marc P an antiques dealer friend, based in Brittany. A posy of nasturtiums from the garden in a small R Lalique vase added a bright splash of colour to the table. Wednesday has rolled around again and that means that Susan @ A Southern Daydreamer is holding her Outdoor Wednesday party, here. 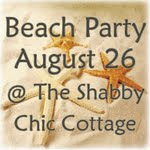 and.............we are also joining Gina @ The Shabby Chic Cottage for her Beach Party today. Click here to join in the beachy delights. These ladies do such a wonderful job hosting these great get togethers so please do pop over & say hello. At the weekend we loaded up the car with Ben, the cocker spaniel, a snack & some books and headed for the beach at Colleville sur Mer. I had hoped that the Parisiens, who holiday there during the month of August, would have headed home by then and we would have the beach to ourselves, the way we like it, but sadly no. We parked the car a short distance from the sea, and after Ben & I had got our feet wet a little bit unloaded the canvas chairs, towels & books and settled down for a good read. After a while I tore myself away from the goings on at Angelfield House and looking up I noticed that there was something going on over at the lifeguard station. I picked up my camera and mooched over to take a look. I met a group of people from the "Surfrider Foundation Europe" who were promoting "Initiatives Oceanes", their aim is simple: keep the seas clean. This is also the base for "char à voile" (sand yachting) and I enjoyed walking around looking at the various yachts "parked" on the sea front. This very colourful and strange looking yacht transporter caught my eye. I hope you have enjoyed our stroll along the beach today, I enjoyed sharing it with you. 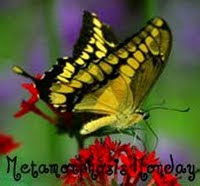 It's the start of the week so it must be time for Metamorphosis Monday hosted once again by Susan at Between Naps on the Porch. Click here to see all the great ideas & projects that others have been working on. All summer long I have been participating in the "92 days of summer" scrapbooking competition being hosted by Cat & the DT over at Your Memories by Design. They had the great idea that we should take a photograph every day and then each week produce a layout, of either one or two pages, using 7 photographs that best represent the week we just had. The competition runs for 13 weeks in all. So my very first contribution to MM is a scrapbook page layout "before and after". This is the collection of items that I thought I might use for my week 10 page. This was a trial run of how to arrange the photos. My theme was "signs". I had been around and about that week taking pix of signs that I found quirky and interesting. A restaurant where we had lunch one day, the local bar/tabac/convenience store, a seller of lobster & crabs, the wine sellers, a street name & a tourist route road side sign. The finished LO includes photo #7, I decided upon a rusty old "Stop" sign but photographed from the back to make it more interesting. 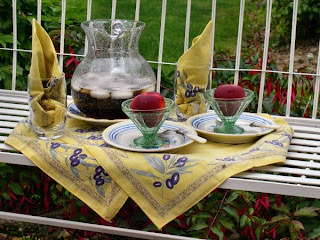 Today I'm joining, for the very first time, the gracious hosts of both Tablescape Thursday at Between Naps on the Porch hosted by Susan and also Foodie Friday hosted by Designs by Gollum. The weather here in our little corner of Normandy has been perfect for al fresco dining this week. 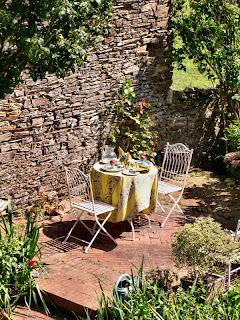 I have just the spot to place a small wrought iron table and two chairs, sheltered from the breeze by an ancient stone wall and perfumed by the climbing wisteria which is still flowering so late in the season. Relax and enjoy the view over the garden and I shall pour you a cooling glass of iced tea. For lunch today I thought you would enjoy some locally cured jambon, a meltingly soft chunk of brie and pain de campagne still warm from the boulangerie. 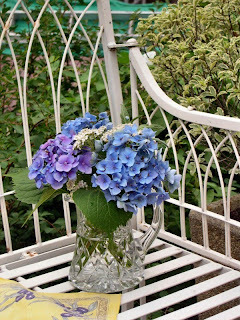 A Waterford crystal jug holds a pretty bouquet of blue hydrangeas and wild flowers picked on my walk this morning. 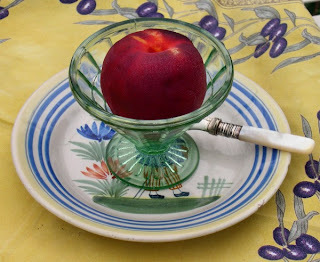 On such a pleasant day the ideal dessert, a simple ripe nectarine warm from the sun served in a 1940's green pressed glass dish set upon a handpainted Quimper plate featuring a man and woman wearing traditional Normandy costumes. or you can click on the QCI Logo on the sidebar to go straight to the QCI website for a special membership offer. 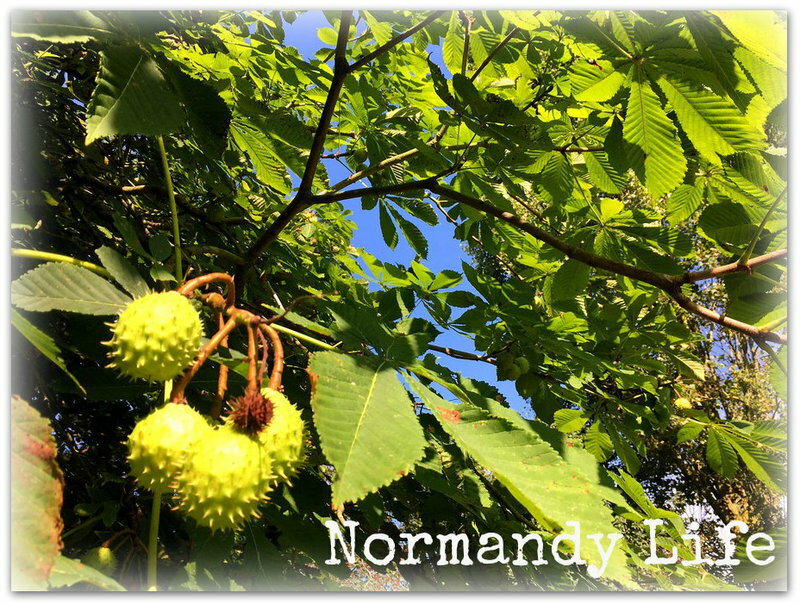 I have so enjoyed your company at lunch today and I hope you'll come and visit Normandy again soon. When the middle of the week comes around the place to be is at the Outdoor Wednesday party hosted by Susan at A Southern Daydreamer. 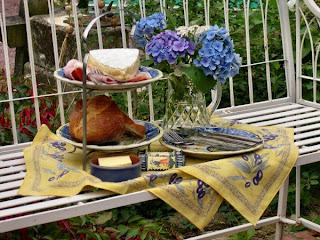 On the two tier Quimper cake stand are "Scones a la Florence", filled with raisins and topped with almond flakes, they make a perfect picinic treat. Follow the link below to hear the 1932 recording of Henry Hall & his Orchestra and "The Teddy Bears Picnic". Have a wonderful Outdoor Wednesday everyone......The Bear Family.